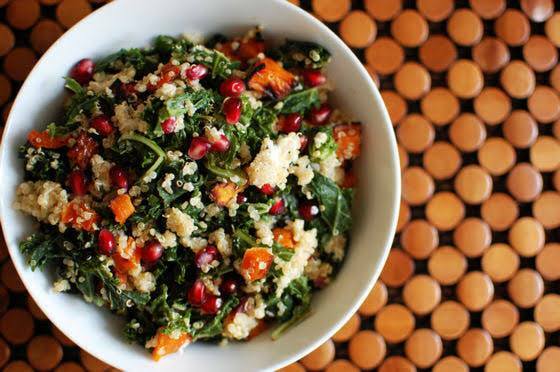 KALE, QUINOA & POMEGRANATE SALAD. Quinoa, kale, roasted pumpkin and chicken salad. 1. Preheat the oven to 180c Celsius. Chop pumpkin into bite sized squares. Coat the pieces in honey or maple syrup. Roast for 20 minutes. 4. Chop kale very finely, its less bitter and rough if you do that. 8. Mix everything together in a large bowl and dress with lemon juice, olive oil and season with salt. I usually make double the amount to have enough for a couple of days. Kale seems to taste even better when it softenes by lemon juice overnight. Enjoy.